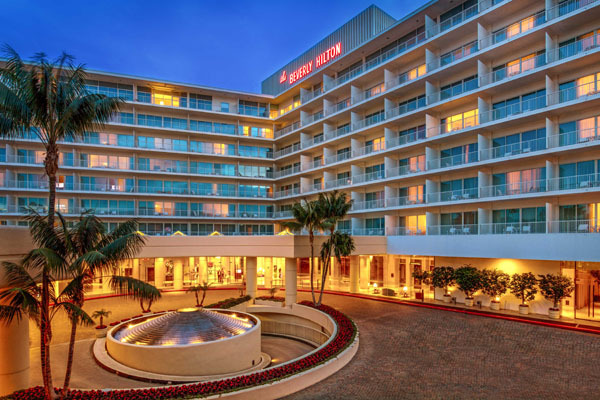 From the minute, you arrive at The Beverly Hilton, you can feel the history and iconic splendor this hotel has to offer. 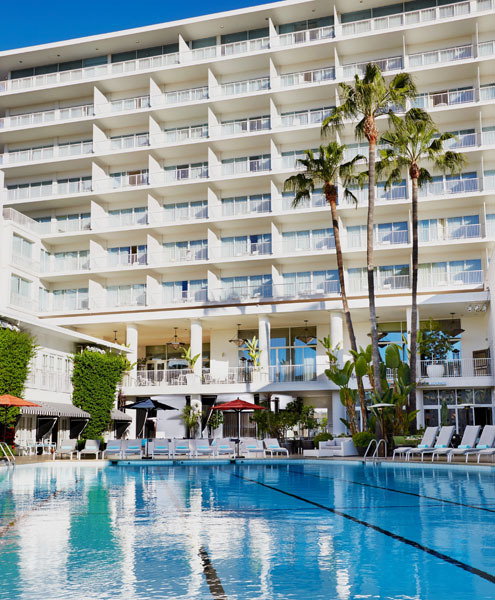 Nestled at the crossroads of Wilshire and Santa Monica Boulevards, the hotel combines the excitement and entertainment of Hollywood with the prestige of Beverly Hills. The 569-room hotel features 101 suites including nine private luxury suites within The Penthouse Collection. The hotel’s renowned International Ballroom plays host to glamorous annual events including the Golden Globe Awards Show, Oscar Nominee Luncheon, Pre-GRAMMYs Gala, and the Milken Institute’s Global Conference. The legendary Aqua Star Pool is Beverly Hills’ largest pool and is the setting for numerous recognizable photo shoots. Circa 55 restaurant entices guests with locally-sourced cuisine in a stylish setting overlooking the pool. The fashion-forward Bellezza Salon is a full service hair and makeup salon and features miniature Swarovski crystal chandeliers with a team that makes you sparkle. The Beverly Hilton opened in 1955 by distinguished hotelier Conrad Hilton. Owned by Merv Griffin from 1987 to 2003, Beny Alagem and Oasis West Realty LLC purchased the 569- room hotel in 2003 and immediately embarked on a spectacular $80 million renovation, which was completed in 2008. Since then, an additional $19 million in refresh updates have been made. Without taking away the history, the renovation has freshened up the hotel without taking away all the history we love. Now for some Hollywood history: Esther Williams, film star and swimmer extraordinaire officially inaugurated The Beverly Hilton’s Aqua Star Pool (the largest in Beverly Hills) by swimming through white gardenias with three of her swim students. The hotel’s ground-floor nightclub, the Bali Room (now the International Ballroom), was so versatile that its beautiful jeweled stage and dance floor could be converted to an ice skating rink when the occasion called for it. July 10, 1960 marked the Democratic National Convention Closing Ceremonies; Presidential nominee John F. Kennedy held a gala fundraiser at The Beverly Hilton where his pal Frank Sinatra rounded up a host of celebrities including Milton Berle, Janet Leigh, Tony Curtis, Judy Garland, Mort Sahl and the entire ‘Jack Pack’ to mingle with the crowd of 2,800 supporters. By the time Judy Garland began her second number, the crowd had filled two separate ballrooms to capacity. In October of 1988, the Cary Grant family chose The Beverly Hilton – one of the actor’s favorite hangouts – to host a one-time-only tribute to Cary Grant. Hollywood insiders, Monaco royalty and dozens of legendary entertainers (including Frank Sinatra, Liza Minnelli and Burt Lancaster) came out to celebrate their personal connections to both Cary Grant and Princess Grace (Grace Kelly). Along with First Lady Maria Shriver and a small group of 60 friends, Governor Arnold Schwarzenegger celebrated his 58th birthday in July of 2005 with a California-shaped cake specially designed by The Beverly Hilton’s executive pastry chef. The icon of The Beverly Hilton is a starburst – a symbol of space and freedom. Originally mounted over the grand staircase in the main lobby, this symbol was personified by a magnificent sculptured Starburst weighing 500 pounds and stretching to 15 feet, created by famed artist Bernard Rosenthal. Today, a portion of the original sculpture remains on display in The Oasis Courtyard. There is no other hotel in Los Angeles, and few others in the world, that could host the Golden Globes with the same ease, style and glamour. 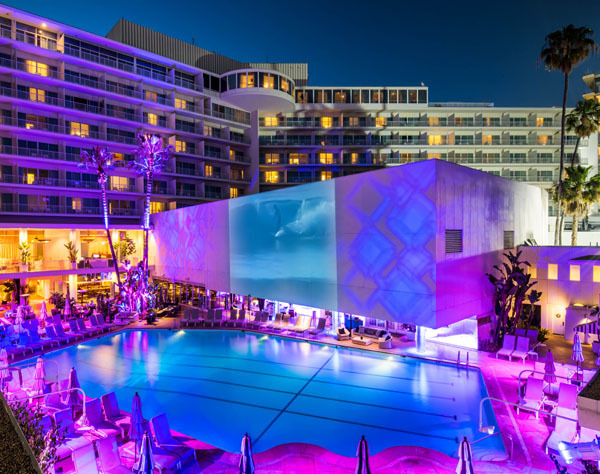 The hotel’s vast size and upscale event space not only allows over 1,300 guests to gather in the International Ballroom for the live telecast, five entertainment companies also throw large viewing and after parties simultaneously in areas throughout The Beverly Hilton’s nearly 9-acre property. In spring 2017, the hotel premiered a stunning new garden collection designed to emphasize a seamless indoor/outdoor experience within a lushly manicured, city-center oasis. The Gardens collection is comprised of three distinctive settings: the alfresco Wilshire Garden with sprawling lawns and striking waterfall features; the Secret Garden featuring cozy nooks, chic seating and lush living walls; and the picturesque California Terrace, offering a harmonious transition from indoors to outdoors with a retractable wall of windows, leading an elegant connection to the grand Beverly Hills Ballroom. These new gardens create a unique urban oasis that enhances the overall experience. During my stay, there was an incredibly decorated wedding ceremony going on in this new outdoor space. It was absolutely fantastic with an elevated isle that the wedding party literally danced down. The sound system was amazing and the garden was beautifully lite for an early evening affair. The living wall was stunning and added a sense of modern flair. I truly enjoyed my stay at The Beverly Hilton. 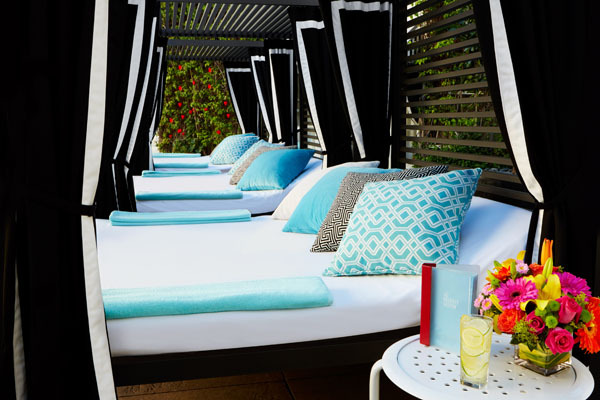 Whether siting poolside having a relaxing breakfast, attending one of many special events, or walking to Rodeo Drive and its fabulous array of shopping, this truly iconic hotel will make you feel like you are a part of Hollywood. A must stay when visiting LA!